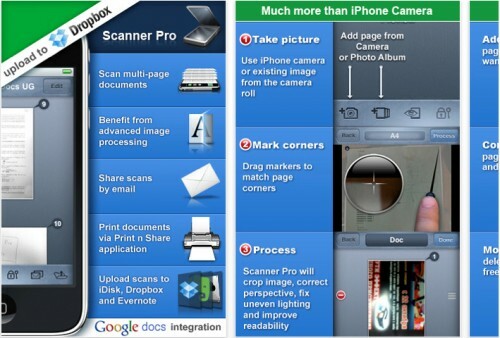 Scanner Pro is a powerful iPhone app that “transforms the device into portable scanner”. Just updated to version 2.0, the app adds GoogleDocs integration, camera stabilization, automatic edge detection and passcode protection. It costs $6.99 in the App Store but is a free update to existing users. a hard copy document should be scanned and there is no scanner nearby. It lets people scan multipage documents, email them and even upload to Dropbox, Evernote, MobileMe iDisk or any other WebDAV enabled server. The application incorporates special algorithms to enhance image quality and make it as readable as possible. While it is a bit on the complex side once you learn how to use the app it is remarkably powerful. The App Store review team received, reviewed and released the new version in less that 4 hours!! How long will it take for Apple to reject review Opera’s browser for the iPhone? I mean, they are still “reviewing” Google Voice months and months later without actually accepting or rejecting it aren’t they? Readdle’s Scanner Pro 2.0 is available now for $6.99. You can get it here.